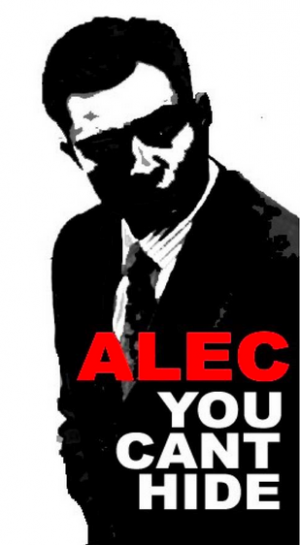 ALEC is Fracking Up Our Democracy! If someone told you that if we all just trust in the free market, the environment will magically clean itself up, what would you say? What if this person were part of a powerful organization that writes many of our environmental laws? 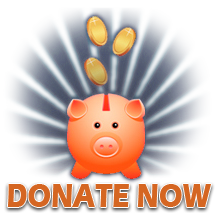 What if this organization were made up of multinational corporations seeking to amass even more power at the expense of the rest of us little people? This organization is real, and it has a name: ALEC. The American Legislative Exchange Council produces model legislation written by corporations and major industry lobby groups, then dishes out these bills to legislators from around the country. Its annual meeting is coming up in the last week of July, and you can bet ALEC has some new tricks up its sleeve. 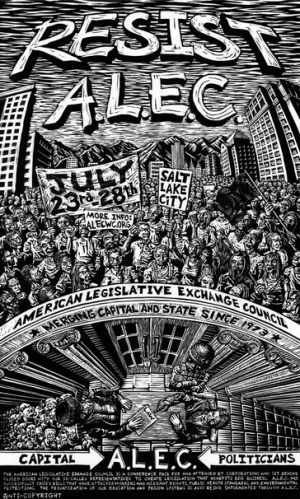 ALEC doesn’t only influence environmental policy, of course—it successfully pushes laws that suppress voter turnout, encourage racial profiling, and bust unions, just to name a few of ALEC’s favorite causes. But ALEC has done a tremendous amount of environmental harm with its dozens of anti-environmental bills. ALEC’s Energy, Environment, and Agriculture Task Force—funded by groups as innocuous and environmentally concerned as ExxonMobil and the American Petroleum Institute, and co-chaired by American Gas Association—thwarts citizens’ democratic right to protect their health and environment. The following are some of the primary mechanisms this task force uses to further this mission. ALEC claims federal regulations like the Clean Air Act and the Federal Safe Drinking Water Act are silly and pointless. After all, ALEC claims, carbon dioxide is good for us! A 2011 ALEC presentation entitled “Warming Up to Climate Change: The Many Benefits of Increased CO2” presumably explained how, but alas, the general public could not hear it, being banned from the conference along with the media. Just trust us on this one, say the corporate overlords. ALEC uses this peculiar breed of mad science to justify a plethora of anti-CO2-regulation bills like Resolution in Opposition of Carbon Dioxide Standards. Utah passed HJR12, Climate Change Joint Resolution, which demands the EPA cease regulating CO2 immediately. This bill actually claims that climate change has been invalidated by the “Climategate” scandal, despite a lengthy letter of protest signed by 11 BYU professors that thoroughly debunks the bill’s logic. ALEC also pushes bills that aim to break apart regional initiatives to regulate climate change, like State Withdrawal from Regional Climate Initiatives. Other bills let states opt out of global climate change mitigation agreements like the Kyoto Protocol, making it near impossible for the U.S. to join any kind of global agreement. By the way, a bill very similar to ALEC’s “Resolution to Retain State Authority Over Coal Ash as Non-Hazardous Waste” has passed the House. The idea that public lands exist for all people—not to mention the concept of wilderness for its own sake—don’t sit well with ALEC. That’s why ALEC introduced the Sagebrush Rebellion Act. This bill seizes BLM lands for the states, letting industry-friendly states like Utah lease or sell formerly public lands to mining companies without the long review process mandated by the BLM. Utah has passed this bill—and with tar sands mining poised to begin on a commercial scale this summer, the Sagebrush Rebellion Act sets the stage for a massive expansion of the dirtiest, most resource intensive form of mining in the world. ALEC laws deny citizens the right to outlaw or downscale industry practices they find unacceptable. But then again, the corporate overlords surely wouldn’t do anything to harm the populace, ALEC assures us. The State Pesticide Preemption Act only aims to “ensure the safety of America’s food supply through the preemption of city, town, county, etc. pesticide ordinances.” Nothing to see here, folks. Meanwhile, ALEC gives an outlandish array of protections to the biggest polluters. ALEC’s Private Property Protection Act assures corporations that our tax dollars will compensate them for land they can’t pollute. Other bills, like Conditioning Regulations of Non-Pollutant Emissions on Science Act, restructure authority in ways that privilege big polluters. This particular bill makes it more time consuming to challenge and halt polluting practices. If you’re worried that public schools are turning our children into militant eco-warriors, you’ll be relieved to hear about ALEC’s Environmental Literacy Improvement Act. This act requires the “balanced” teaching of global warming, meaning teachers must present skepticism as an equally valid theory. It gets better: Environmental education must “not be designed to change student behavior, attitudes or values,” says ALEC. Thank heavens—we wouldn’t want our children to start asking their parents to install wind turbines or stop using lawn chemicals, would we? Versions of this bill have passed in Tennessee, Louisiana, Texas, and South Dakota, and Utah has its own Petroleum Literacy Act, allocating $750,000 to teach children about the importance of oil, gas, and coal in their lives. One more neat aspect of this bill: It creates a state panel to review environmental education, but this panel excludes environmental education professionals from its membership. In other words, an environmental science prof would not be qualified to review environmental education materials. Industry executives (who are allowed to serve on the panel) are plenty knowledgeable about the environment anyway, right? ALEC aims to intimidate activists with model bills like the Animal and Ecological Terrorism Act. Like the federal Animal Enterprise Terrorism Act that led to conviction of the SHAC 7, this ALEC bill labels a broad range of activities as terrorism. Even handing out flyers or holding a sit-in could be considered terrorist activities under this bill, which passed in Texas. Likewise, ALEC’s Environmental Corrupt Organizations—Preventative Legislation and Neutralization (ECO-PLAN) Act gives the government the power to shut down organizations labeled as eco-terrorist groups under the bill’s vague terms. 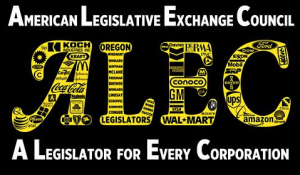 Don’t let ALEC continue polluting our democracy with these outrageous bills. 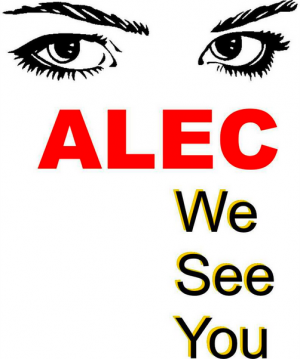 Join us this week at Washington Square to rally for a world beyond ALEC! The big con infests America. To STOP it, just SHOW it.